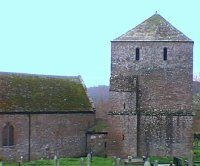 The earliest record of a monastery here is in 615 AD, but it was with the arrival of the Knights Templar in 1180 that the history of the church at Garway becomes clearer. The Templars built a number of partly round churches (copying the Holy Sepulchre in Jerusalem) including this one. The round foundations can be seen clearly on the north side of the church, and the original carved chancel arch still survives. There are so many fascinating things to see and discover at Garway that this space is too limited. You can find out more from Audrey Tapper's book, available in the church. Most of the current church -- no longer round -- is probably 13th century, including the massive tower which was once separate from the main church building. Here are just four of the carvings to find, all inside the church and some quite difficult to spot: a "green man" (click the picture for a clearer view) , a sword, a fish and a snake. Garway Church is a very important part of the community and in addition to regular services it is used for other events, for example: a historical pageant about the history of Garway and Archenfield, a May Day celebration, a well-dressing (at the re-opening of an ancient holy well), preservation of wild flowers in the churchyard, and a Festival of Memories. For more information about the church, visit the relevant Historic Herefordshire Online page. And don't miss all the detailed information about the church and many facets of Garway past and present at the Garway community website. See also the Great English Churches website. In Garway, you'll find the common and the Garway Moon Inn. From the pub, go west past Garway Primary School and carry on out of the main village for about a mile. Pass the road to Garway Hill (signposted to your right) and carry on down the lane until you reach several houses. Turn sharp left at this point (by the Baptist Chapel) and go slowly down the hill for 100 yards, then left onto a track which leads to the church itself. Please park carefully and do not block entry to the farm fields next to the track.